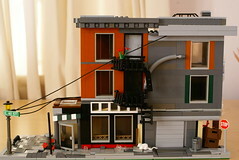 Brick Town Talk: A Building Downtown - LEGO Town, Architecture, Building Tips, Inspiration Ideas, and more! from AT94's flickr photostream. Some things are intentionally imperfect here, to give it a more realistic city look. I think the typical North American downtown has certain unique characteristics. During the postwar economic boom in the 1950s, the residential population of most downtowns crashed. That's true, and it's quite unfortunate. There's a small town north of where I'm attending college, and was once a thriving town. Then a majority of the mining left after the war, leaving a derelict downtown.